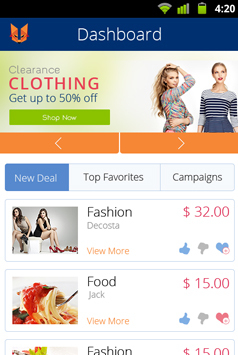 Deal & Campaign app is an application which allows users i.e. the retailers to promote their deals and the campaigns over the app so that the other users i.e. the customers will come to know about the latest deals and campaign and can be able to avail these services. How Deal and Campaign App Works? Users can download the application which is available on iTunes store / Google play store . 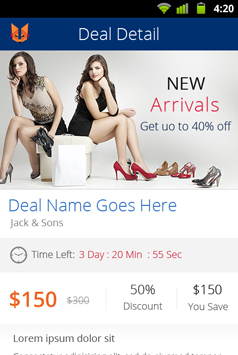 The app is created with a simple goal, helping users to easily share the details regarding the deals and the campaigns. As this application is developed with iBeacon Technology so if user will pass nearby the retail shop and their Bluetooth is enabled then they will be able to get the notification about the deals and the campaigns. The concept was very unique and our technical team has faced challenges in integrating the iBeacon technology in the app. The other challenges faced were the product and user management according to the deals and the campaigns offered by the retails store and to deliver unified user experience. This application i.e. 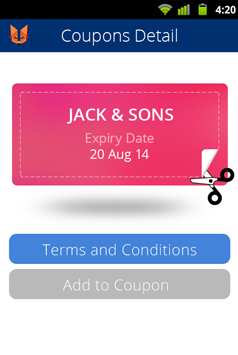 Deal and Campaign app using iBeacon technology was developed for iOS and Android platforms. So, we needed to assign dedicated team for both platforms i.e. Android and iOS. The team has been consistently monitored by the Project Manager to make the application live and as per the client expectation. "GREAT JOB BY FLEXSIN! Even though the project was really complex and there were times that it looks.. The team has been continuously researched to make the features compatible as per the desired frameworks and technologies. At the end, team has successfully implemented the feature of iBeacon technology which allows the users to get the notification about the deals and the campaigns when a user who has already installed this app and if his/her Bluetooth is enabled whenever they visit near the store. Flexsin has successfully developed this application as per the client requirements and delivered it successfully to the client. Client is extremely happy with the end result and the end product we delivered is a Deal and Campaign App where the users i.e. Retail store owners would be able to post the latest deals and campaign and other users i.e. the customers will be able to get the notification about these offers and all this will be done by using the iBeacon Technology.